In 1938 an indestructible character from the doomed planet of Krypton called Superman burst forth from the pages of Action Comics and launched a whole new genre – the SUPER HERO! 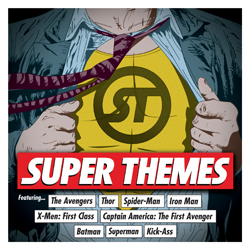 This 2CD set celebrates the many classic film and TV themes which have accompanied the adventures of men of steel, caped crusaders, web-slingers and many more. Over 50 years of themes are gathered across thirty-three tracks from Neal Hefti’s incessant 1966 Batman theme all the way to Hans Zimmer’s thunderous 2012 The Dark Knight Rises music. This cinematic and TV tour of music for men in tights underlines the calibre of composers (John Williams, Danny Elfman) involved and the everlasting quality of the themes.